Capt Hugh Roberts was the son of Llain Hir Edern, Llyn, where he was born in 1826. Hugh had served as an apprentice aboard the schooner Cevn Amlwch built at Nefyn by another Roberts, possibly his future father in law in 1838; young Hugh served aboard her in the coasting trade from Feb 1840 and August 1847 four years as an apprentice and three and a half years as a mate. He then sailed on a foreign voyage as second mate aboard the Fortuna of Aberdeen Jan 1848 – Oct 1848 before returning to take command of the Fairy of Caernarfon 1849 – 50 again foreign trade. 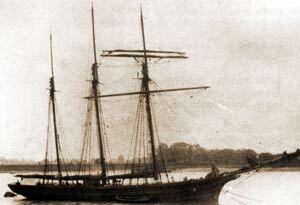 By 1851 he was therefore a well established master mariner who had seriously sufficient resources to embark upon a ship owning partnership with Edward Beck a slate merchant of Gallargate, Newcastle upon Tyne, in 1851 they each took 32/64 in the Edward Beck and in 1857 another schooner the Miss Beck, was built for them at Porthdinllaen, to be followed in 1864 by the brigantine Fanny Beck 153 tons also built at Porthdinllaen. In each case Capt Hugh Roberts appears to have been the first master of these vessels before handing them over to other master mariners from the Nefyn area. By the 1870’s Hugh Roberts had come ashore as a ship broker at 24 Quayside, Newcastle; he was living at 63 Lorraine Street Place, Newcastle, and in the early seventies took over the management of his first large vessel, the wooden barque Glenrosa 476 tons built at Sunderland 1864. The Lewis M Lamb 381 tons built at Newcastle upon Tyne in 1871 and the Jesse Morris built at Nova Scotia in 1872. Beck was possibly dead by 1875 but his sons continued as slate merchants. Hugh Roberts was certainly in business on his own account by this time; in 1875 a new brig was built for him at Porthmadog in which he had 36/64 and another Edern master mariner John Jones, the remaining 28/64. Roberts subsequently sold or transferred 8/64 each to Jane Roberts, widow, Edern (his mother ?) Griffith Roberts, 29 Quayside, Newcastle (his son?) and William Parry, Llaniestyn, saddler and a further 5/64 in 1887 to David Davies, Dean Street, Newcastle ‘ship owner. 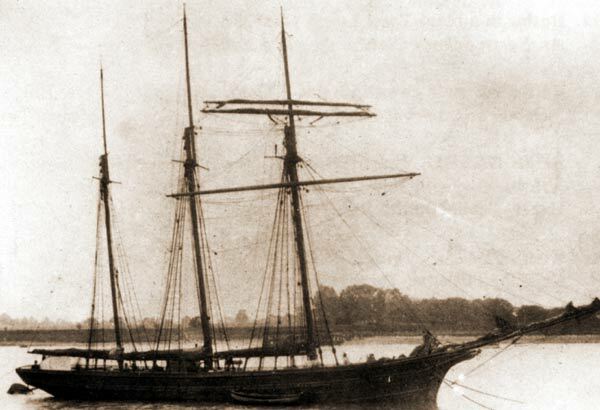 In the same year that Hugh Roberts left the blocks in Porthmadog, the iron sailing ship North Wales was built by Humphreys at Hull for Capt Hugh Roberts and thus began a shipping company that spanned two world wars and was the longest lived of the shipping companies formed in the 1870’s which had their roots in North Wales. The “North Wales” was not a lucky ship and in mid January 1881 she was lost off the Haisborough Sands when outward bound with coal from the Tyne for Java. A court of inquiry held at North Shields attributed her loss to misapprehension on the part of the pilot as to the position of the vessel, and from neglect to use the lead. The master was reprimanded for trusting too implicitly in the pilot, and for not verifying the vessel’s position independently. Other losses included the Fanny Beck which Capt Hugh Roberts had himself commanded in the early days she sailed in October 1879 from Buenos Aires in ballast to the Patagonian coast to load for the U.K. Her master was Capt William Williams aged 24 and there were four passengers aboard, no doubt intending to settle in the newly established Welsh settlement. Nothing more was heard of the Fanny Beck, her crew or passengers. The Glenrosa a ten year old barque was abandoned in the Atlantic in heavy seas in October 1883 en route for Buenos Aires from Cardiff. The North Durham was last heard of on December 17th 1893 en route from Gibraltar to Grimsby, her master was Capt William Williams Edern, six men from the area were also lost as well as two from Pwllheli. Shortly after the first world war the North Anglia was lost in the Bay of Biscay and men from the Nefyn area have again lost their lives. Even though Hugh Robert’s company was based at Newcastle he always had a pool of men from Nefyn and Llyn working aboard his vessels, as we can see from the above master’s names. 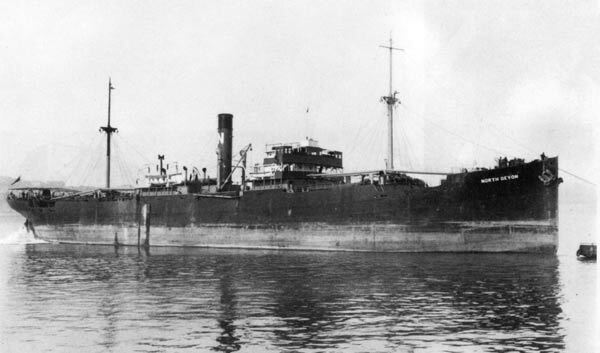 The “North Wales II” was lost off the coast of Chile, when she was sunk by the Germans, on November 16th 1914. *In 1964 Common Brothers of Newcastle took over the company, but they still kept the name ‘North Shipping Company’ and the last vessel remaining, the North Devon was sold to Liberia in 1967. Thanks to Mr T Morris for all his help with this article.